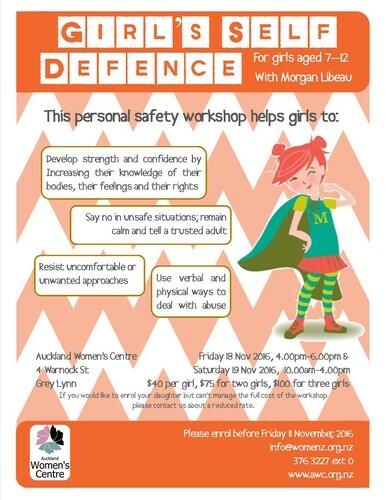 Girls' Self-Defence Workshop (7-12 Years) may be the upcoming event you’re looking for. Give your daughter the opportunity to learn: to identify unsafe/safe people and situations, ways to resist unwanted or uncomfortable touch, how to use verbal and physical ways to deal with assault or abuse, how to say no! in unsafe situations, remain calm, and tell a trusted adult. "I liked the class because it was all girls taught to be safe. I liked my teacher." "Standing strong, roleplaying, shin and knee kick, punching. Drawing meeting new people, lunch." "Blocking, punching, shouting, kicking, my favourite is having lunch, and learning how to keep safe." "Boosted self and other awareness. Improved self-confidence. Thanks!" "(name) has experienced an increase in confidence subsequent to her first self-defence course. In addition, she takes more pleasure, satisfaction and interest in her own physical strength and prowess. Morgan is a qualified Self Defence Tutor who has been teaching now for over 15 years. Initially, she taught women and girls Self Defence but for some years has now concentrated only on the children's class. Morgan has written a number of books for children and young people on issues of sexual abuse, therapy and court preparation for child witness'. She believes that if information is given to children appropriately it will make them feel safe instead of scared, enabling higher self-esteem and confidence. Cost:	Concession rates offered, $75 for two girls booking in together and $100 for three girls booking in together. For more details, contact reception or email us at info@womenz.org.nz.